There is something about circles the Beloved likes. The circle is important in Islamic art as the teachings actively discourage the use of human images. Elaborate and beautiful patterns formed from a centre point of a circle are constructed in both art and architecture. From the circle, other shapes can be constructed, the triangle, the square, the hexagon and various star shapes. Each shape came to have different spiritual meanings. Geometric flower or plant patterns are also used. For example a triangle is formed from the repeat of three circles. 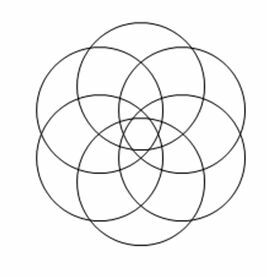 Many of the patterns are made from overlapped and interlaced circles which are then repeated. The yin yang symbolizes the polar opposites found in the universe forming a whole by their combination. The two spots contained in each half represent the seed of the other, ready to transform. There are many variations of the symbol and the fluidity of the circle lends itself to artistic interpretation. References to the yin yang appear in the I Ching, written more than 2000 years ago. 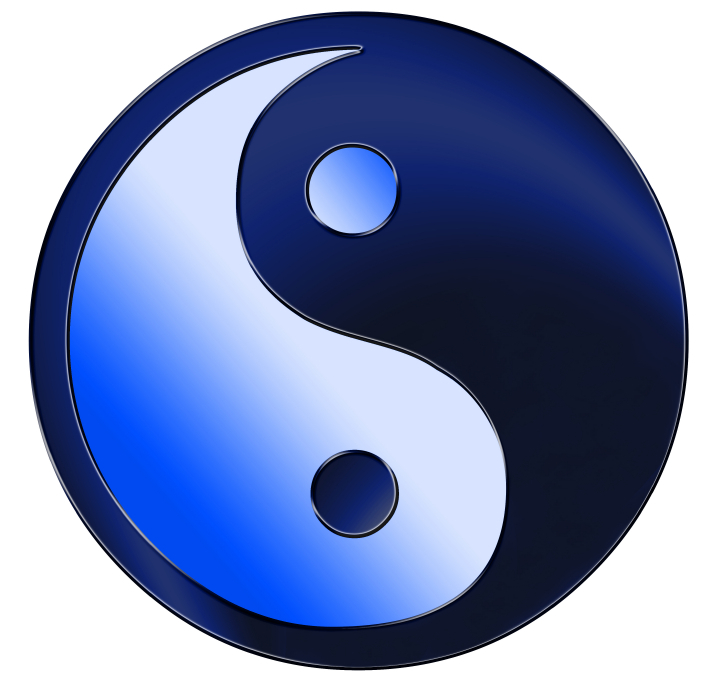 Chinese medicine embraces the use of the yin yang and the polar opposites to treat a variety of illnesses. In classical Chinese medicine, one must choose the correct food and have the right psychological outlook to maintain equilibrium. Natural phenomena are also grouped according to the precepts of Taoism. For day the opposite is night; summer is opposite to winter; light is opposite to dark and so on. The Yin yang symbol represents that events of the world and possessions are appearing and dissolving continuously, just as the elements of which they are composed go through their birth-and-death cycles. ”The principle of Yin and Yang is the foundation of the entire universe. It underlies everything in creation. 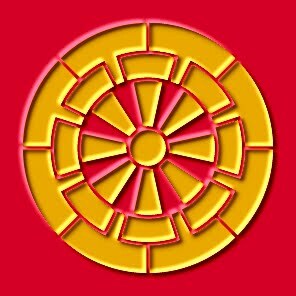 The Buddhist Wheel of Life or Dharma represents the suffering and impermanence of life. It is portrayed as an 8 spoked wheel, and the spokes symbolize the Eightfold Path. This is the foundation of Buddhist practice. It is the way to end suffering. These are a practical set of rules to live by and combined with the Four Noble Truths, form the basis of Buddhist belief. There is a path to the ending of suffering. The wheel of life, Samsara, is common to both Hinduism and Buddhism. It is a symbol of birth and death. Each rotation of the wheel is equivalent to a lifetime, and once a rotation is completed, then the life cycle begins again. Lots more decisions in the last few days. Last Thursday at school, a child went to hit me. A deliberate action on his behalf. Other students went to get the principal. No remorse & no consequences. Today a child did hit me in the face, knocking my glasses off and poking my eye. An accident – I was tying his shoelaces and he lost balance. Child was very remorseful. A lesson from both incidents. In the Hindu and Buddhist traditions a Mandala symbolizes the universal unity and movement associated with cycles of renewal. Celtic, Ancient Greek and Roman and Islamic traditions also used Mandala like images for religious and contemplative practices. The meaning of Mandala in Hindu is concentric energy circle. In Mandalas there are many layers that spiral through and link consciousness with healing, sacred geometry and psychology. 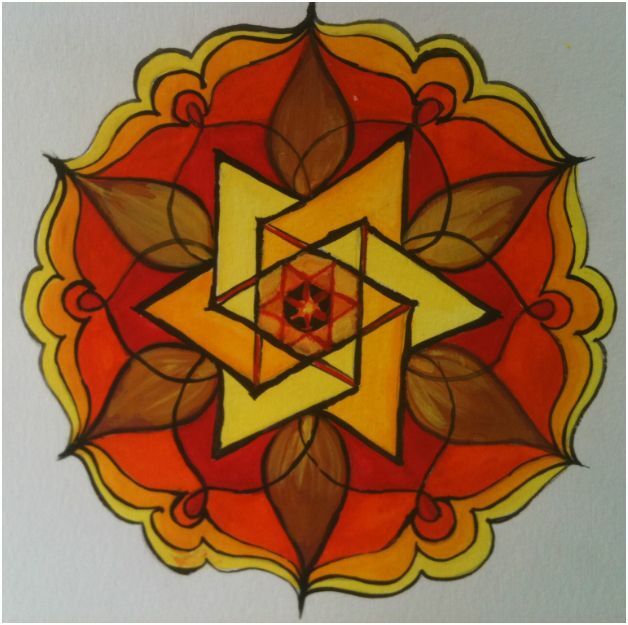 Carl Jung painted Mandalas and believed that they were a representation of the “unconscious self” which then enabled the healing of emotional disorder within him. Tibetan monks and Navajo Indians are both famous for their sand Mandalas, which once completed are brushed away, symbolizing the impermanence of the material. A Buddhist Mandala will incorporate 5 elements and 5 colours. Other references within the Mandala will be to the Lotus and the 4 Noble Truths and the Eightfold path. As you can see, it becomes quite complex. 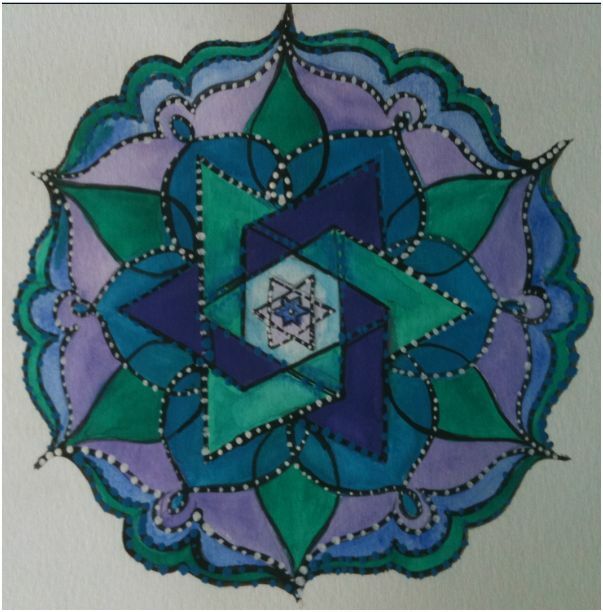 There a numerous sites on the web to access Mandalas and an interesting exercise is to take one design and have several people colour it. They will all be quite different in look and energy. 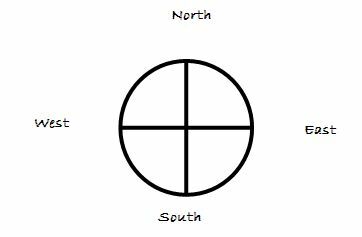 The four equal lines coming from the centre form the basic pattern of the Medicine Wheel used in Native American traditions. The lines form a compass, pointing to the spirits of the North, East, South and West. The quadrants also represent the basic elements of Earth, Water, Air and Fire and again in Native American tradition they were placed in a specific order. The elements were attributed with specific colours, emotions, and animal totems. The North is a place of healing. It is time to be grounded and go within yourself and rest and contemplate the lessons learned. Age is associated with Winter and with age and experience we attain wisdom. The white of winter symbolizes spirituality and purity. We are reminded to stop and listen to the lessons. It is time to sleep and dream. The animals of the North, the buffalo, moose and bear, know to prepare for the winter and store layers of fat to nourish them while they hibernate. The element associated with the North is Earth and the colour is green. To the East lie new beginnings. This is where the sun rises each day with a fresh start. It is the direction of the physical body and is important for new-born and young children. The season is Spring, the time of change when growth begins and one awakens from the winter. The awakening allows us to embrace new ideas and see the light. The sun rising each day gives us the energy to do new things. Yellow is the colour of the path of life that we walk down. Here we can shine at what we do best. The animals here are of the air and include the hummingbird, owl and hawk. The element is Air and prayers are said when facing to the East so that our voices can be carried by smoke or air to Spirit. The Southern part of the Medicine Wheel was of great importance to the Native American and the self was placed here. The emotion associated with the South is passion, the expression of the fire in the soul. The fertility or growth is also associated with summer and the maturation of the seed into fruit and the child into adult. This is a time to be aware of the changes taking place and to use the energy and heat of fire and sun to learn, grow and understand the cycle of change. The animals associated with the South are the Eagle, Lion and Wolf. They represent the characteristics of pride, strength and courage. The West corresponds to Autumn, the later stages of adulthood. This is where the sun sets and twilight begins. When the darkness falls, we must show courage and look inward to find the light. It is an emotional time, the element being water, and it is the place of the family and all the love and associated responsibilities that come with family. Here we learn about responsibility to self and to others, while we prepare for the coming winter. We also learn that what we see in the darkness may only be a shadow. The element here is Water and all the emotions that go with it. The animals of the West are the beaver who demonstrates team work and the snake that sheds its skin in order to grow and change. You have noticed that everything as Indian does is in a circle, and that is because the Power of the World always works in circles, and everything tries to be round….. The Sky is round, and I have heard that the earth is round like a ball, and so are all the stars. The wind, in its greatest power, whirls. Birds make their nest in circles, for theirs is the same religion as ours…. Today was D-day. Decision day. Actually I didn’t make the initial decisions, I handed that over to Margaret and just went with the flow. New territory to explore, starting by going to Doncaster Shopping town. Never having been there before (been past, but never inside) even finding the designated meeting spot was going to be a challenge. With an eye on the clock, as I had run a little late with a Reiki client earlier this morning, I managed to find my way into the car park and arrived 5 minutes late. Whoops! First stop DJ’s. Really the only stop apart from a foray into Myer. What a difference in shops. DJ’s fitting rooms quite spartan & service was great, compared to lavish fitting rooms (but incredibly messy and dirty) & non-existent service at Myer. Margaret had spent some time earlier in the week checking things out and selected a number of garments for me to try. Looking at them on the hangars, I did wonder……. but was happy to try them on and was pleasantly surprised at the results. A couple were not quite right and put aside. Last week we discussed my budget and Margaret selected accordingly. Bonus was that I had put my glasses aside whilst trying on the clothes, so couldn’t see the prices anyway! I made the decision not to look until finished, as well as not looking at sizes. Margaret showed me which pieces would go together and eventually we had a small pile of clothes to take to the checkout. In different combinations, probably about 8 or 9 outfits. A couple of plain camisoles from Myer added to the collection and that took longer to find and pay for them than trying on all the clothes in DJ’s! To complete the outfits, a couple of bling necklaces and then sat down and with a cuppa to recap the day. Never thought that I would enjoy clothes shopping, but I did! The simplest way to divide a circle is into quadrants or to place a cross within it. When divided this way, the sacred circle can have many interpretations. The Celtic cross is formed from this simple sacred geometry and the North American Medicine wheel is also created from this form. The Celtic cross predates the use of the cross as a Christian symbol by several centuries and was used by the Druids and earlier cultures. Druidic spiritual practice was recorded as early as the 4th & 5th centuries BC by the Romans and whilst a few stone circles have been located, these were not the only centres of spiritual practice. Often a circle of trees or an earthen mound near water sufficed and later Christian churches and chapels were built on these spots. The Christian priests chronicled the history, and existing Druid and Celtic rituals and festivals were gradually given a Christian overlay. 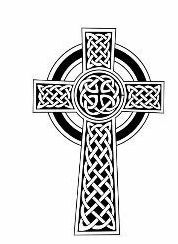 The Celtic cross was originally was two intersecting lines that had short, equal length arms surrounded by a circle. The stone at the centre represented the sun and four more “suns” were found in each quarter. The stone pillar of the cross also embodies phallic and fertility characteristics. A circle on its own was a symbol for the moon and a circle with a cross through it represented the sun. The circle also represented the spiritual journey of life and death in a never-ending cycle. 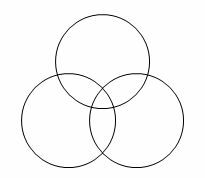 The cross within the circle also relates to the four directions of the earth and the intersection of the lines implies the bringing together the energies of heaven and earth. 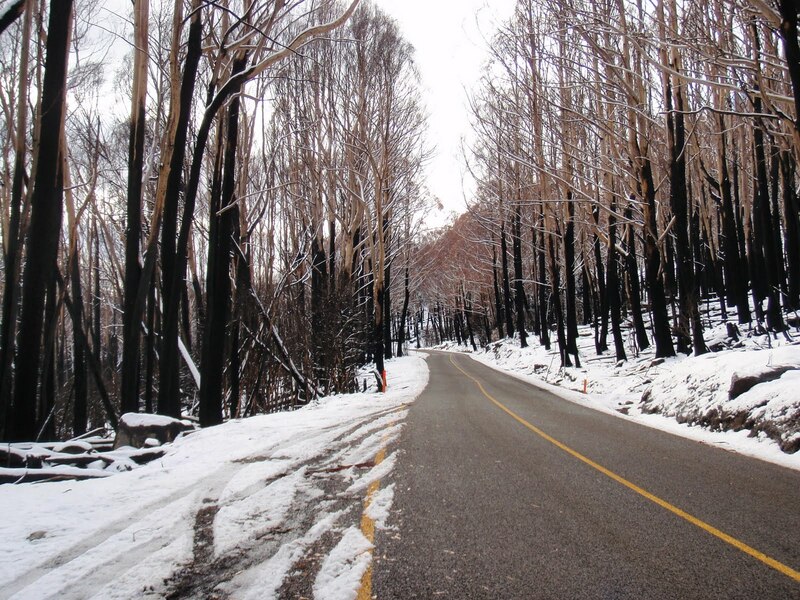 One month of winter to go….. already I am so over the cold weather and grateful that we spent a month travelling north where the temperatures were in the high 20C to 30C. I need the sunshine and warmth to function. Probably comes from having born in the tropics. Already the spring bulbs have started to flower and the plum tree has buds ready to blossom, so there is the promise of warmer weather in the offing. I don’t mind the rain at all and it is comforting to listen to it on the roof as I am drifting off to sleep, and am glad to be inside a house and not a camper trailer with the strong gusts of wind. A busy month ahead, with new work committments shaping up already. This is an exciting phase to be in and I look forward to the days in my new clinic rooms. Wednesday sees Phase 2 of the wardrobe makeover and this means shopping. This will be interesting. Who said change was difficult? or painful? This is liberating!